What gives Tom Acitelli’s “The Audacity of Hops” a sense of structure is following the paths of innovators in the field of craft beer in the U.S. He isn’t satisfied with name-dropping. He wants to take you along for the ride with these dreamers and beer nerds. He breaks his book up into tiny, biographical sips separated chronologically and geographically, beginning with 1965 in San Francisco. I’ll focus in this installment on the segments that deal with 1970 in Davis, Calif. through to 1973 in Munich, Germany and Brooklyn, NY. We’re introduced in these chapters to Michael J. Lewis, who became the first full professor of brewing science in the U.S. Indeed, many of the leaders of the nascent craft beer scene during the 1970s appear to be academics. 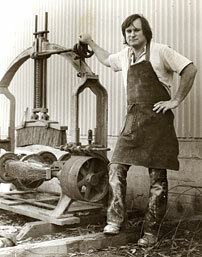 Lewis worked at UC-Davis, and by 1970, created the nation’s first bachelor’s degree in fermentation science. Acitelli focuses on how open-source these beginners were, in the sense that they believed that knowledge about the brewing process should be shared. I found that Lewis’ book, “Brewing” is available on Amazon, and from what I can tell, it’s about getting the newbie to jump into the hobby with everything he or she has. Acitelli does a very clever thing at the end of his piece on Lewis in 1970; he mentions a brief meeting between Lewis and Jack McAuliffe, a curious homebrewer who would later found New Albion Ale. It’s as if we’re following the journey of McAuliffe in bildingsroman fashion. 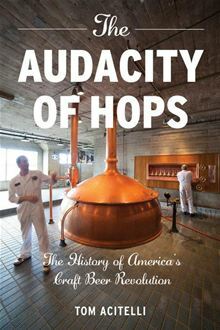 The chapter on John Murphy of Miller Brewing, focusing on 1970-1973 is enlightening, not so much for the character development (Acitelli gives us some surface detail like height, weight, and demeanor), but for the plot that details a fun wrinkle in the history of U.S. craft beer. He takes us from a Munich restaurant, where Murphy and George Weissman, chairman of Philip Morris International are introduced to a “Diat pilsner,” which was a “cleaner” tasting pilsner than they’d ever had. The “diat” part referred to fact that it had fewer carbohydrates and less sugar, thanks to a longer fermentation. This leads to Miller’s breakthrough concept (after a few false starts): “lite” beer. The U.S. has been sucking down that piece of beer evolution for generations. It’s a nice sidebar to a story about craft beer that shows how necessary the return to independent brewing became. For posts by Acitelli, check out his work at Curbed. This entry was posted in Beer Snob and tagged The Audacity of Hops, Tom Acitelli. Bookmark the permalink.